The Rolex Yachtmaster II Ref. 116680 is a significant moment in Rolex history. It has the luxurious appeal that only a Rolex can have in an entirely new range of watches that feature the brand's first new complication in over fifty years. There is no denying that Rolex is a luxury brand through and through. Whilst fifty years ago they were still expensive, the majority of their watches were tools designed for a purpose. The Explorer was a time-only watch that was just as comfortable up a mountain as it was at the dining table, the GMT Master was purpose built for trans-continental pilots and the Daytona was a marvelous evolution of a dress chronograph to racing timer. The Rolex of yesteryear is not the Rolex of today. Their current watches are still as versatile as their predecessors yet you are more likely to see a Submariner at a board meeting than aboard a ship ready for a dive. I am not bemoaning Rolex or their watches as markets and strategies change. Since the quartz crisis it would be foolish for any Swiss watch maker to make mechanical Swiss Made tool watch that competed directly with their digital counterparts, especially in the fields of science, exploration and sport. The moment that Rolex pivoted from tool maker to luxury sport watchmaker was in 1992 with the introduction of the original Yachtmaster Ref. 16628. This watch took heavy inspiration from the Submariner yet it screams luxury as it was made in 18kt Yellow Gold and only had a water resistance of 100M. It's creamy white dial and black onyx hour markers is far more at home at the harbor than underneath the bay and whilst it shared the same movement as the Submariners and Sea-Dwellers of the time, I doubt anyone was strapping it over a wet-suit. The Yachtmaster was a form over function watch, a luxury watch designed as a sports watch, and whilst there is nothing wrong with that, I can say that I've never cared for the original Yachtmaster series. The blocky bezel text, the soft edges that dilute the Submariner look, the excessive amount of gold is just not for me . I still feel that the current line of Yachtmasters, like the current Omega Constellations, are stuck in this nineties design that seems dated compared to the rest of the collection. However the Yachtmaster sold very well with several new references coming out over the new decade. In 1994 two new sizer of 35mm and 29mm were added for smallers wrists in the Refs 68628 and 69628, in 1999 Rolex's steel and platinum alloy Rolesium was debuted in the Yachtmaster Ref. 16622 and in 2005 Rolesor (Gold and steel) was shown off in the Ref. 16623. It is obvious that the primary objective with the Yachtmaster series was to evoke luxury. Rolex is easily the world's most recognisable luxury watchmaker and it could be said that their iconic line up that has remained essentially unchanged since the seventies has left them hamstrung with no wiggle room for imaginative or unique designs with true complications. As a comparison, Omega have made tourbillions, central tourbillons, watch cases from ceramic, industrialized an entirely new escapement yet Rolex didn't make a new complication in over fifty years. It is true that there are watches Omega made that were failures but at least they attempted something new. The first Rolex complication was the Ref. 8171 and remains one of the most sought after and rare Rolexes that isn't a Daytona. Only produced for a few years between the late forties and early fifties, there is estimated to be only 1000 ever made. Whilst The triple calendar moonphase is iconic of that period in watches so the design itself is nothing new but having a Rolex Triple Calendar Moonphase is so very special. It has been nicknamed in Italian "Padellone" or "Big Frying Pan" in English because of it's large 38mm case and flat profile. Another Rolex complication made around the same time, the Ref. 6062 utilized the same movement but placed it inside the Oyster waterproof case. This piece is even rarer with only 500 examples being known to exist. 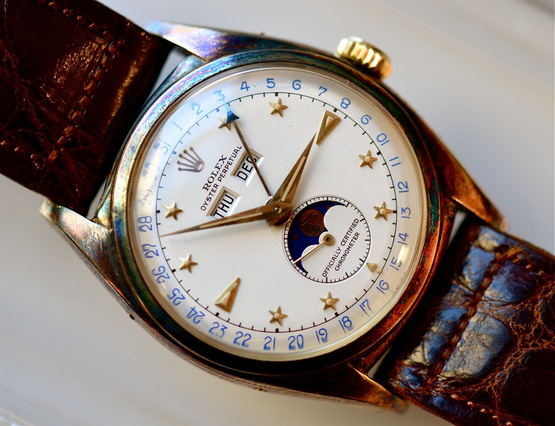 Sixty years went by and Rolex still never made another complication. 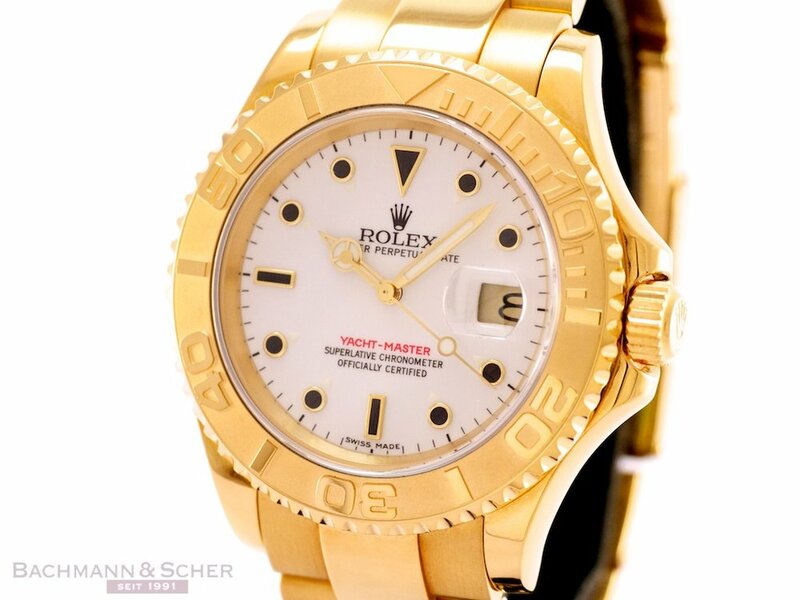 In 2007 Rolex unveiled the Yachtmaster II in 18kt Yellow Gold, Ref. 116688, and 18kt White Gold, Ref. 116689, and at a glance it appears to be a chronograph in a Submariner-like case. However this was no ordinary complication as the Regatta Countdown marked the first new complication since the GMT Master in 1954. As far as complications go, a Regatta timer is probably as niche as you can go with it's intended purpose to allow skippers to accurately time down to the beginning of a regatta. Before a race begins, a countdown timer is heard at certain intervals which signals the boats to start sailing along the start line and prepare to begin racing. Crossing the line swiftly is essential to gain a good position however crossing early gets you penalized. By using a regatta timer, the sailors are able to countdown to the perfect moment to cross with ease and this is what the Yachtmaster II does. Rolex patented the complication in 2005 and the newest Calibre, the 4161, took over 35,000 hours to develop. Previous regatta timers either used apertures or a traditional chronograph layout to display the time but none could be corrected mid-countdown, none could be reset to a specific time and none were programmable. The Yachtmaster II is a flyback regatta chronograph that can be pre-programmed to a specific time and can be reset on the fly to that predetermined time. It's a marvellous achievement on Rolex's behalf even if the use of it is incredibly rare. On the dial you have the traditional hour and minutes with a sub-dial for running seconds at the bottom. Beneath the hour markers from 7 to 4, you have the regatta timer which can record countdowns of up to ten minutes with the short red arrow hand and the large red central chronograph second hand. To set the watch you turn the bezel into setting mode, unscrew the crown and simply adjust the red arrow hand to the required amount of time. Return the bezel to the original position, screw the crown back down again and you are ready to regatta. Upon resetting the chronograph it returns to the nearest minute rather than zero and the chronograph continues to run allowing the wearer to know they are in sync with the official regatta countdown they just heard. The build quality on the Yachtmaster II is second to none with the bracelet feeling solid and the clasp feeling buttery smooth to use. Using the command bezel is easy albeit slightly odd at first to use a bezel without the usual ratcheting click click click sound as this is just one smooth turn. The blue cerachrom is utterly stunning and as you can tell in the photos is so vibrant and colorful. If I could change one thing however it would be the YACHTMASTER II script at 6 o'clock on the bezel as there is already enough text on a Rolex for my liking. If something has to have been put there I would have preferred Regatta Timer or similar but worrying about it now is a moot point. At 44mm, the size of the case is likely to turn off those wanting a more traditional case size and whilst it does feel large, I think the size is necessary to allow the regatta function to be read clearly. It's an amazing watch but I do wonder that the singular use and niche appeal of the complication does limit it slightly. The steel model is certainly the sportiest of the available references yet at $18,750, it is an expensive alternative to something a $100 digital timer can do. If you absolutely needed a regatta timer, I'd probably suggest that the Tissot Sailing Touch would be a more realistic alternative which is less than 10% of the price of the Yachtmaster. The pragmatic rubber strap and digital display lacks the sophistication and elegance of the Yachtmaster II but I wager you wouldn't be as forlorn if it fell to a watery grave. I would wager that the Yachtmaster II sees the least amount of wrist time out of all the current Rolex collection but that shouldn't diminish the horological achievement of the complication nor the milestone of Rolex's first new complication in fifty years. Whilst it was designed to meet the needs of professional sailors, it was never designed to be affordable. If price is no concern and you've been feeling that your recent regatta performance needs some Swiss precision, then the Rolex Yachtmaster II Ref. 116680 is the watch for you. Everything begins somewhere: A conversation with the founders of Marloe Watch Co.